Chunn’s Burying Ground also known as Oak Glenn Cemetery in Fox River Grove, Illinois is one of the oldest cemeteries in McHenry County according to McHenry County Historic Preservation Commission. The cemetery named after local business man T.R. 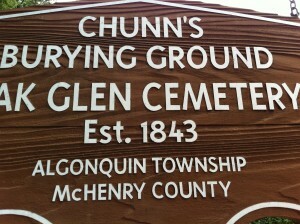 Chunn, a pioneer in the area who owned the property and buried there. Several websites say the site is an old Indian burial ground. 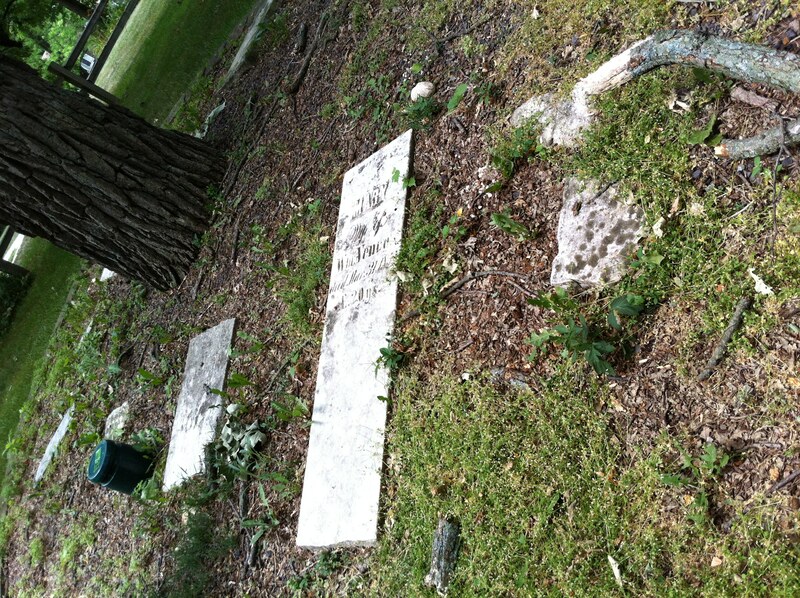 Nestled in a wooded area at the top of a hill, the historic cemetery on Algonquin-River Road next to Algonquin Road School. 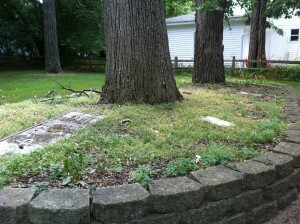 Over the years the cemetery became overgrown with weeds and brush. 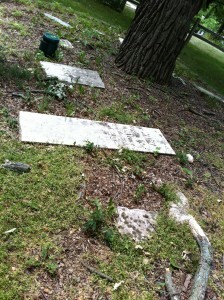 Arnett Lines, a local historian, inventoried and transcribed the gravestones in 1944. 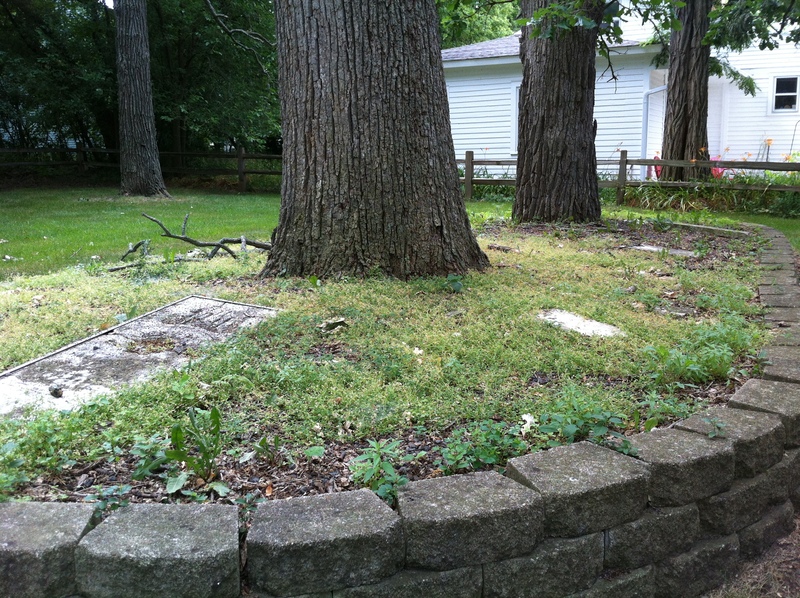 The remaining headstones were relocated to a raised bed under a stand of trees for protection. In 2008, the cemetery was rededicated and designated a historic site. A bronze plaque on boulder at the cemetery entrance notes the historic status. Today the site is well maintained quiet park lined with a wooden rail fence. A sign outside the cemetery stays “Chunn’s Burying Ground Oak Glenn Cemetery.” As we walked through the park, we came upon a well-marked geocache. Geocaching is a real-world outdoor treasure hunting game where players try to find hidden containers, called geocaches, using GPS-enabled devices and then share their experiences online. We logged our find at the geocache and online. 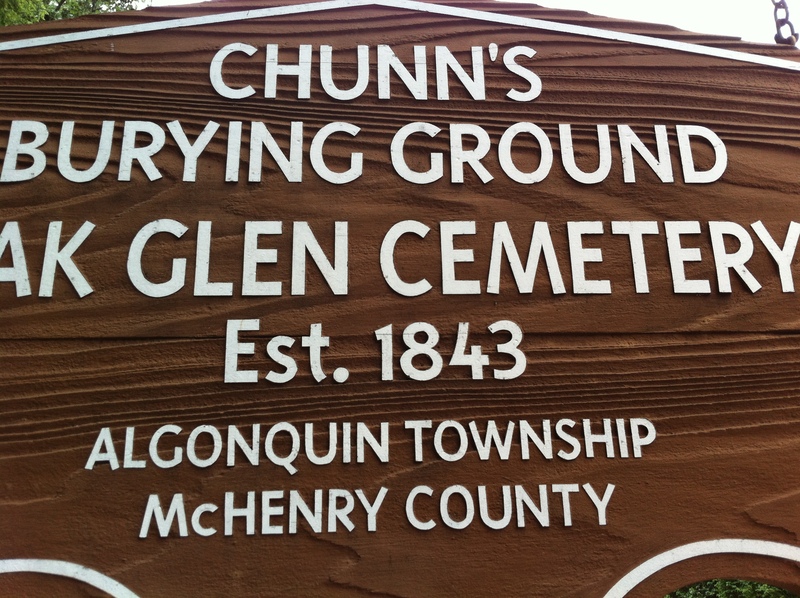 The next time you are on Algonquin Road, take a few moments to visit Chunn’s Burying Ground Oak Glenn Cemetery in Fox River Grove. The peaceful setting is perfect for a few minutes of quiet reflection. You can log an easy geocache while you are there. We will highlight selected McHenry County, Illinois businesses on this blog over the next several weeks. Located in northwest Illinois, McHenry County is a diverse blend of retail, wholesale, manufacturing and agricultural business. Woodstock is the country seat. Housing options range from in-town condominiums to single family homes on large lots to rural homes and farms. McHenry County includes these Northern Illinois suburbs, cities or villages and unincorporated areas. Follow our tweets on Twitter and Facebook. The 200 or so residents of Alden, Illinois may feel a bit slighted. Alden is at the intersection of Rte 173 and County Hwy 1, between Hebron and Harvard. Big Foot is another McHenry Co. community, at the intersection of State Line Road and route 14 north of Harvard. It is in Wisconsin and Illinois. Chemung is a small community on route 173 west of Harvard. My apologies to Alden, Big Foot and Chemung for omitting them from the list above. Before writing this article, I contacted the McHenry County Webmaster to be sure I had all the municipalities. This was the response I received. Lists all the websites for all the Villages/Cities in McHenry County…Thanks..